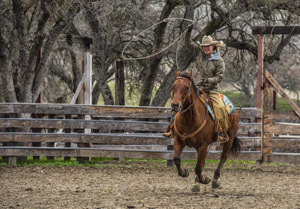 Branded by timeless western tradition, rustic family fun, and wholesome outdoor adventure, the ranch encompasses fertile green pasture, rolling foothills, lush woodlands, and fresh, sparkling streams. This is an adventurous destination for anyone who wants to get in touch with his or her inner cowboy. 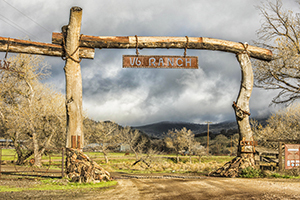 Situated in the Cholame Valley about halfway between L.A. and San Francisco, the V6 Ranch, owned by the Varian family, is a jewel in a haystack plucked from days gone by. In native language Cholame means “beautiful one” — and this valley lives up to the name. The family-run Parkfield Cafe and Parkfield Lodge provide home-cooked meals and comfortable beds for some much-needed slumber time at the end of a long day of cattle wrangling. The first time I visited the ranch it was bone-dry mid-July. It’s a different experience in the cool, often showery springtime months compared to the arid, dusty summer — but both seasons provide ample opportunities to kick back and relax or head out to the range for an authentic western experience and some unforgettable photo ops. 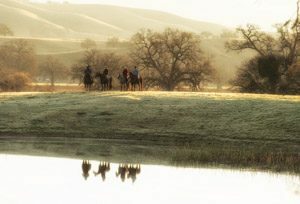 There are over 50 miles of riding trails to explore on the 20,000-acre ranch nestled inside the majestic Diablo Mountain Range in central California. The variety of seasonal changes offers countless ways to experience soft glowing sunrises, painted sky sunsets, and awe-inspiring vistas throughout the sprawling, unspoiled landscape. You can endlessly wander the hillsides and trails breathing sweet mountain air and tasting the aroma of a fresh spring rainfall. After a long, gentle evening rain the golden brown hillsides and pastures are transformed into a thick, jade green carpet overnight. Spring weather is unpredictable so be prepared for damp, misty mornings, but you’ll be blessed with temperate sunny days, deep blue skies, and white, puffy clouds most afternoons. The Varian family pride is their grass-fed cattle. The secret is found in the climate of the V6 Ranch itself. The well-irrigated grazing pastures are high in nutrients that create a healthy, hearty herd. Guests hone their skills at the Cowboy Academy where they practice roping and cutting or help out herding during a cattle drive. 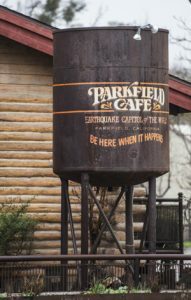 Take a two-hour horseback ride, go on a self-guided earthquake tour (Parkfield is the earthquake capital of the world according to the U.S.G.S. ), or explore the Star Gazing Guidebook and plan a cosmic adventure under the star-filled night sky. Cycling enthusiasts will love the Parkfield Loop. Starting in San Miguel, the 71-mile round-trip ride is a gradual ascent then a breezy downhill glide into the scenic little town for a refreshing break at the Parkfield Cafe before heading back. Make sure you have enough gas for the round-trip drive from San Miguel to Parkfield if you’re traveling by car since there is no place to fill up once you get into Parkfield. 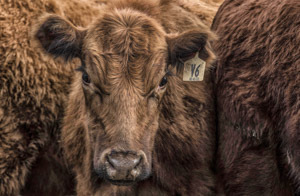 When you come to the V6 Ranch you’re met with a warm greeting, a friendly smile, and the undeniable connection to the land, the livestock, and a simpler way of life peppered with a savory taste of western-style adventure. A “Spur” of the Moment Decision Led to an Experience of a Lifetime! Bodie… Second to None for Wickedness!